Upgrade your Remington 700 rifle to the popular CDiPrecision Gunworks mil-spec AICS detachable magazine system. 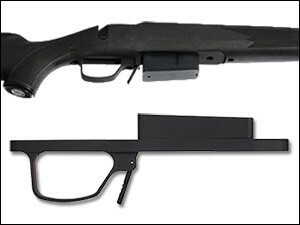 Upgrade your Remignton 700 rifles to a detachable magazine model that uses the popular AICS Magazines. This Bottom metal assembly allows the use of AICS magazines in your Remington 700. Install is required, and CDI Precision will provide installation free of charge when purchased through us. You can simply send the stock you have or the stock you are purchasing from us direct to them. Available in Long or Short Action. The magazines with front binder plates are compatible with all rifles equipped with AICS-pattern bottom metal or chassis systems. The binder plate holds the cartridges back from the front of the magazines and guides them past the bottom of the feed ramp. The maximum cartridge overall length (COAL) that will fit in this magazine is 2.870”. The magazines without front binder plates allow a maximum cartridge overall length of 2.960”. These are compatible with all AICS-pattern bottom metal and chassis systems, but most common actions such as Remington 700 and Savage 10/11 will require modifications to the receiver (i.e. notching out the bottom of the feed ramp) to prevent the bullet tips from catching on the bottom of the feed ramp (see photo below). DO NOT order these magazines without a full understanding of this.